The Thorny Issue of "Undiagnosed"
When I learned that Complex Child was soliciting articles that would share the experience of being undiagnosed, I really struggled with myself. "Undiagnosed" is a concept our family has lived with for quite some time. We have a true love/hate relationship with it and it has often divided my husband and me. Did I really want to spend time looking this issue squarely in the eye? In the end my answer was yes. Lacking a diagnosis requires stamina and strength; it also requires a willingness to dig deep for answers. In that spirit I couldn't resist the opportunity to explore "undiagnosed" as I never have before. In the beginning, we did not realize that we were heading towards either having or not having a diagnosis. How could we even start to think of such things when we were faced with the immediacy of dealing with the issues our son's symptoms presented? We were caught up in vomiting (lots of it), nebulizer treatments, tube feedings and endless therapies. When my son wasn't receiving therapies, we were in the office of the pediatrician or a specialist. Sometimes there was medical testing to be undertaken, a surgery to be had, or a hospitalization to endure. Oftentimes the specialists were just keeping a very close eye on things, seemingly no better able to predict what might be next than we were ourselves. And once our son entered the special education system there were endless hours devoted to advocacy to assure his educational needs were being met. Our son had been born 10 weeks prematurely, and to complicate the matter of diagnosis even more, he was adopted. In fact, I didn't meet my son until he was nearly two years old. By the time we met, he had been treated for seven months in the NICU and had resided in a pediatric rehabilitation center. There seemed to be every reason to believe that the medical issues and developmental delays he exhibited were due both to his prematurity and to his unusual social history. Numerous doctors who had watched him struggle and nearly die during his first two years were beyond happy when he made his home with us. They were simply convinced that the love and affection we provided--not to mention intense medical and therapeutic intervention--would cause him to turn the corner. According to them, he was on his way. One doctor even made the fateful decision not to replace our son's feeding tube after it had fallen out overnight shortly after our son arrived at our home. After all, now that our son was surrounded with a family's attention, he would certainly start to eat better and no longer need a tube. Imagine the feeling of frustration and failure we had when the feeding tube was being surgically reinserted three months later. We would faithfully bring our son to visits with the developmental pediatrician every six months and be told with a smile, "He is closing the gaps." The problem is that he wasn't. Yes, he was making progress, but closing the gaps would require that he make more than six months worth of progress within a six month period of time and he clearly wasn't doing that. I struggled with the pediatrician, and even changed pediatricians along the way. I was told that although many preemies "catch up" by the age of two, it would just take our son longer due to his early institutionalization. We needed to give things more time. The therapists who worked with our son would express their own frustrations. They really felt that given the intensity of the services they were providing, our son should be making more progress. Yet he continued to exhibit significant delays in all areas, especially language and gross motor. School was a challenge. It took no less than three years for our son to master his colors and be able to produce their names in response to a direct question. Medical issues continued to loom over our heads: failure to thrive, aspiration, severe and persistent reflux disease, recurrent ear and sinus infections, asthma, hypotonia, and lab and imaging results that always seemed to come back with some quirk. I am not sure when it happened or what brought the change about, but at a certain point I knew that I needed to take a stand. I could no longer tolerate hearing that my love would eventually turn things around for my son. It was clear that we were dealing with something that I did not have control over. I needed to know what it was so that I would no longer feel guilty that I had somehow not been the medicine my son needed. Maybe prematurity precipitated this, but it caused something--or was caused by something--and I wanted to know what that something was. I wanted all of this to have a name. I actually thought that finding that name was going to be a relatively simple process. There were lots of signs and even an indication from one physician that pointed me in the direction of Cerebral Palsy (CP). I learned that there was a wonderful physiatrist in our area who worked extensively with children with complex medical issues. He had helped many before us to "put all the pieces together." I made an appointment with this physician to evaluate my son's hypotonia and then spent quite some time preparing myself. I was convinced that I would walk into that office with my son undiagnosed and walk out with a diagnosis of CP. And that once it was on paper, I would never be able to take it back. It turns out that that is not what happened at all and I never could have prepared myself for what did. My son did not have CP. The doctor starting rattling off the signs that he saw, signs no one else had ever mentioned to me before (how could that be?). In a mere matter of minutes, I felt my life start to spin out of control. Had I ever noticed his prominent forehead or the fold of his eyes? Had I ever been told that he has a Simian Crease? Here, let me show it to you. I was so grateful that this doctor listened extensively about my son's learning difficulties since no one else really had. Then I heard him mention "Mental Retardation" and the vast spectrum of possibilities associated with that term. 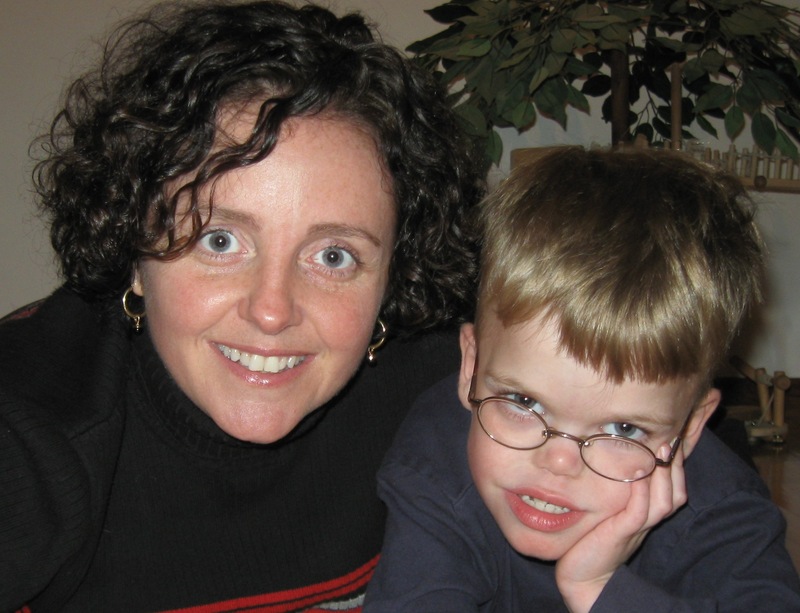 This doctor was of the strong opinion that my son had Mosaic Down Syndrome. In the end, the chromosomal studies proved him wrong, but it was his suspicion that landed us squarely in the world of genetics and that is where we needed to be if we were going to solve the diagnosis riddle. The fallout of that visit at home was intense. My husband and I really struggled with each other regarding the inherent value, if any, that entering the genetics diagnosis phase would have for our son and for our family. My husband was then, and continues to be now, perfectly happy with treating symptoms as they come and hoping for the best. He holds no fear regarding our son's future, he is perennially optimistic, and really has no desire to come up with a name other than the name our son has been given. I adamantly deny being pessimistic about our son's future, but I do take more of a planning role for our son and I think that requires me to look at a variety of possible scenarios. I could not walk away from the possibility that there might be something we would do differently to address my son's symptoms if we knew what was tying everything together. I also just needed to know as his Mom that there was some explanation, something we could point to that would make logical sense, something that would take the mystery, guilt, and doubt away. I truly believe that our son's care is enhanced by both of our perspectives, so I guess our struggle is OK and even beneficial. In the end, we went ahead with genetic testing simply because I felt so strongly about it. To say that the world of genetics has been frustrating would be like saying Mount McKinley is a pretty steep hill. Of course there are the inconveniences of medical appointments, lab work, X-rays, testing, and procedures. There is the extreme frustration of needing to wait until your child gets sick or needs a surgical procedure for certain tests to be done. For me there is also a sense of being completely lost. No matter how much I read or how many questions I ask, there are details surrounding microscopic cellular biology, physiology, and neurology that I just cannot understand. There are difficult decisions to be made along the way: should you only allow non-invasive testing, should you allow testing to interfere with school, and of course there is the need to decide each and every time whether the pain, anesthesia, radiation, or whatever it may be is worth the possible benefit. But these matters actually lie on the surface and I find that my frustration with genetics, my love/hate relationship with the concept of being undiagnosed, comes from something much deeper. And I can name what it is. It is Fear...yes, Fear with a capital F.
I have already explained my fears surrounding the possibility my son will remain undiagnosed. Most crucial is the fear that we might miss an opportunity to ameliorate some of his symptoms or that we might respond to certain symptoms differently, possibly more aggressively, in light of the useful information a diagnosis would provide. Those fears keep pushing me through this maze. However, and just as powerful at times, are the fears that surround actually having a diagnosis. What if we receive a diagnosis that shatters my husband's uncanny ability to see the future nothing short of perfection? Are we perhaps better off then to not know what may lie ahead, to simply enjoy the small miracle each day truly is for each of us? What if a diagnosis brings with it an array of possibilities that may or may not ever come to fruition? Are we setting ourselves up then for needless worry? And what if we receive a diagnosis at the end of this long road, but it provides us with no useful information about what to expect or how to proceed? Will the emotional and physical costs have been worth it? It is hard not to research suggested diagnoses while you wait for weeks, sometimes months, for clinical test results to come back. I know that I find myself seeing many similarities to my son in the listings of clinical features and can pretty easily convince myself that we are finally on our way. Our eureka moment is just around the corner, we are going to have successfully put all the medical, developmental, and genetic puzzle pieces into a syndrome with a name. Then the call comes in. The testing was negative. Forget that it all made sense to you, that you were incorporating the ramifications of this particular syndrome into your life vision for your son and your family, that you thought the long and trying road of diagnosis was about to be over. You can see all the misdiagnoses stored away in your bookmarked links and you start to fear whether you will have the energy to continue with the process at all. You start to really question why it seemed so important to you to begin with. After all of this, I even somewhat hoped the geneticist would give us an out. I asked him if we were really barking up the wrong tree. Couldn't all of my son's symptoms simply be caused by prematurity and the loss of oxygen at birth? Did we really belong in the geneticist's office at all? He must have been somewhat taken aback that I was revisiting this years into our relationship, but the answer was yes, we certainly belonged in the genetics office. There were simply too many "syndrome features" apparent in my son to suggest otherwise. Today, we are probably at the most frustrating juncture of all. Our geneticist highly suspects that our son has a mild form of Pallister-Killian Syndrome (PKS), a duplication on chromosome 12. He also has explained to us that we may never be able to confirm the diagnosis in the laboratory. PKS is a mosaic syndrome, meaning the duplication does not exist in all cells. It is difficult to diagnose via blood tests unless those tests are performed very early in a child's life, and, in fact, prenatally is probably best. We have attempted to locate the duplication without success in skin cells, and at this point the geneticist suggests our only hope of a confirmed diagnosis would be a deep skin tissue sample obtained during surgery. To add to the frustration, we have been in touch with the researchers who are studying PKS and although they have not been able to examine my son in person, they are skeptical that this is the answer. His features and symptoms simply seem too mild for them to believe it could be a match. They had a few other suggestions of syndromes we should look into; and yes, at that point I found myself just needing to take a deep breath. So, in the end, I suspect that "undiagnosed" will be a way of life for us. I am completely able to set the issue of diagnosis aside for large periods of time, but then find myself caught up in it again and call to make an appointment with genetics. Currently we are seen every 12-18 months. Although the geneticist still feels strongly that his suspicion of PKS is well-founded, he monitors our son for any new symptoms or changes to his features that might point him in a different direction. While I try not to obsess about symptoms of PKS that could develop as my son ages, I also try to be mindful so that I can report any concerns early. It is a delicate balance, made even more delicate by the fact that we aren't even sure if this is indeed the syndrome we are dealing with. I clearly remember when I first asked our pediatrician for a referral to genetics. He warned me to be very cautious in deciding if this was the route we wanted to go down. I suppose I could have been defensive and assumed that he thought I was fishing for something that didn't exist, but I sensed that was not his concern and tried to give serious thought to what he was trying to say. At the time, however, I had no way to fully understand his words of caution. Now I do. Michele and her husband are the proud parents of two boys. Her youngest son, now seven, is the subject of this essay. Michele is employed as Coordinator of New York State's Family to Family Health Information and Education Center. The FHIC exists to connect, support, and empower families who are raising children with special health care needs. Michele can be reached at (518) 381-4350 or f2fhealthtools@verizon.net.